We take pride in the level of care we offer the wonderful people of the Oceanside area. Over the years we have implemented specific technologies and procedures to ensure we offer the highest level of dentistry available. 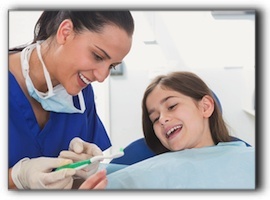 We are pioneers in sedation dentistry in North San Diego County. We chose the name Dental Excellence for a reason – excellence in service and in treatments. Our office environment is a highlight of our patients’ experience when visiting. They are welcomed and treated warmly from start to finish. By design, our team is made up of people who really care about giving the very best that they can and care about the quality of service they provide to each individual patient. Laser Therapy | Using a tiny beam of concentrated light, our dentists can remove infection and gum disease from around the teeth in a precise and controlled manner. Laser therapy is a remarkable advancement in dentistry because it sterilizes the affected area and seals off blood vessels, minimizing the chance of bleeding or recurring infection. Because of lasers’ cleanliness, precision, and safety, most laser therapy patients heal quickly and without complications. Quality Labs | Oceanside Dental Excellence offers access to dental laboratories outfitted with the latest in dental technology. These labs use the highest-quality materials so your dental work gives you many years of comfort and oral health. Dental materials are made to precisely customized specifications so that all our dental treatments feel natural and comfortable. Dental Lasers | We employ dental lasers to kill bacteria after cleaning to make sure your smile looks AND feels great. We also offer soft tissue contouring with our lasers. This is a great option for those with a “gummy” smile or uneven gum line. Prophy-Jet® | This tool allows us to remove extrinsic stain, dental plaque and soft debris while simultaneously polishing tooth surfaces. Digital X-rays | At Oceanside Dental Excellence, we consider preventative family dentistry a top priority. Patients come from all over the area, including Vista and Fallbrook CA, because they know we care about them and their dental health. Digital x-rays can help our dentists diagnose and treat dental issues before they grow into serious problems. These x-rays show up instantly on a computer screen and have several advantages over traditional film x-rays. Patients experience less exposure to radiation, the process is quicker, and x-rays may be easily sent to orthodontists or other specialists outside our practice. Digital technology also allows us to magnify the x-rays for a detailed examination. Oral DNA | We are able to run diagnostics on your saliva to determine if you have have periodontal disease or other mouth related diseases/infections. This can have HUGE positive implications for your oral AND overall health by helping us identify and treat issues before they become serious problems. Intraoral Camera | Thanks to the technology available at our practice, it is now possible to see every area of your mouth in great detail. An intraoral camera the size of a pen can be used to demonstrate the need for treatment, even for early problems that are difficult to see. As Dr. Stephen Dankworth or Dr. Kimberly Corrigan-Dankworth moves the camera inside your mouth, you will be able to see the video footage displayed on a monitor. Helping our patients understand their dental treatment is very important to us, and intraoral camera technology makes it easier than ever to see your dental work from the dentist’s point of view. Digital Imaging | Our cosmetic dentist team at Oceanside Dental Excellence in Oceanside uses digital imaging to show our patients how their smiles may appear after treatment. With digital imaging, our dentists can show you virtual “before-and-after” pictures of your smile. This tool helps patients decide on the most effective cosmetic dentistry options for their needs. Purified Water | For a safe and clean dental practice, it is vital to use purified and distilled water during the patient’s dental treatment. Oceanside Dental Excellence uses purified water and high sanitation standards to provide you with the healthiest possible environment. Rigorous Safety and Health Standards | The Occupational Safety and Health Administration, a department of the United States Department of Labor, regulates medical practices to ensure that they are sanitary and safe. However, there are no standards currently in place specifically for dentistry practices. For this reason, it is important to be sure that your dentist abides by strict self-imposed regulations. Oceanside Dental Excellence has implemented extremely rigorous standards for its medical environment so that its patients and staff are not exposed to any unnecessary health risks. We recommend our patients demand the highest standards of hygiene from their cosmetic dentist. Oceanside Dental Excellence in Oceanside near Fallbrook CA will meet or exceed your expectations for cleanliness because we believe in any medical practice, safety comes first. Paperless Office | Our practice is buttoned up. Everything we do regarding records, X-rays, documentation and other “paperwork” is handled electronically. YOur records are secure and available in a much more convenient format.